Back in the principality for the ultimate street race. But I just can’t figure out if this is an anticipated race or not. The challenge and skill needed to drive a good race here is immense. But the problem with that is that it’s hard to transfer this fact to the spectators. So Monaco does often become a procession of cars as far as the onlooker is concerned. Spiced with the inevitable crash and safety car. This year had crashes, some action and an even more processed procession than usual. 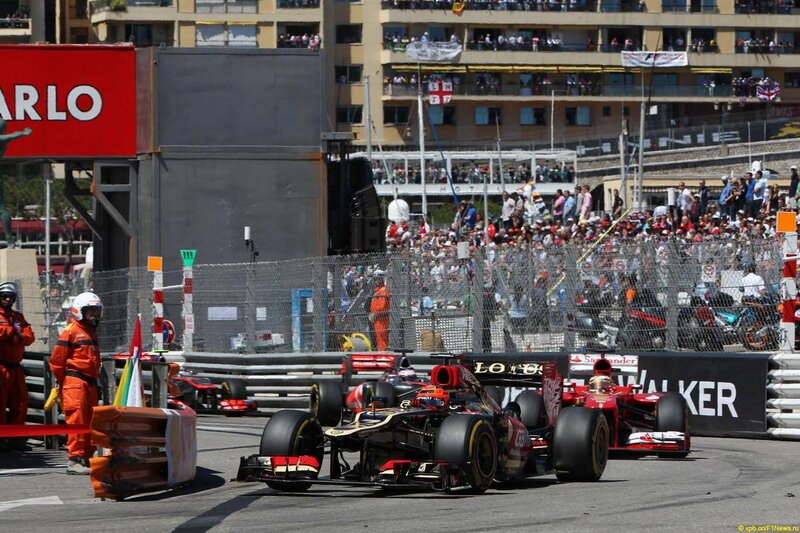 Sometimes in Monaco, the qualifying is the most exciting bit as the outcome of the race is already decided there. Mercedes were expected to shine and shine they did. 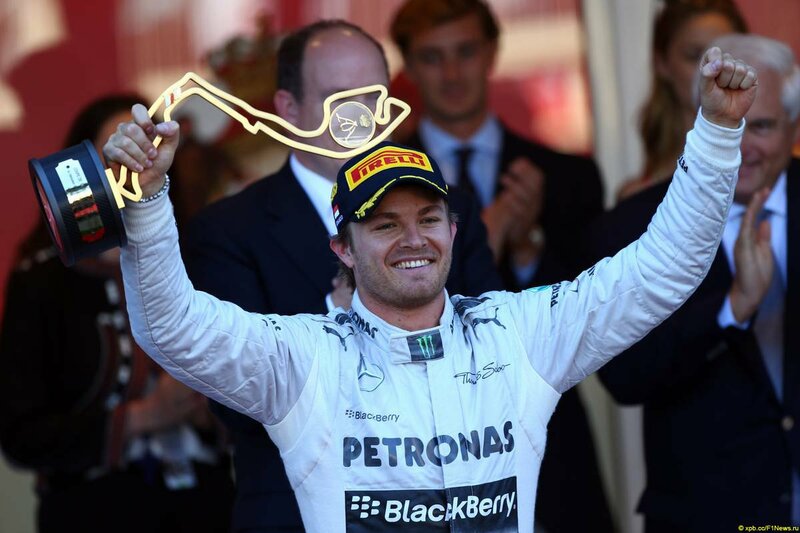 Rosberg in particular. He managed to top all practice sessions and came good in the dry/wet qualifying as well to take his 3rd pole position in a row. The gains Mercedes have made since 2012 is redonkulous. On the other end of the scale we find crash master Grosjean who managed to mangle his car in not one, not two but all 3 practice sessions. Hello! The team only just got his car ready for qualifying where he had to make due with 13th. 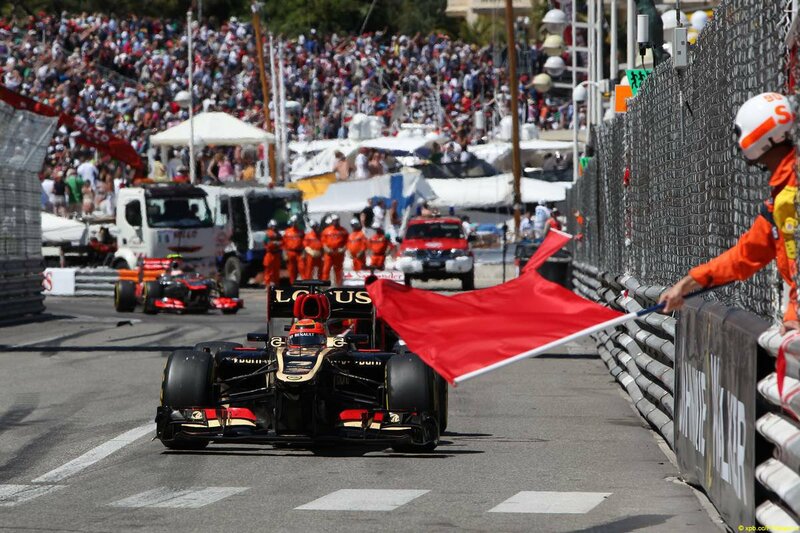 Kimi did much better, but not quite good enough for Monaco. 5th was all that was in the Lotus on Saturday. Both Bulls and Mercs ahead of him. Still, with a 1-stop very possible for the E21, perhaps there could be a podium in the cards. 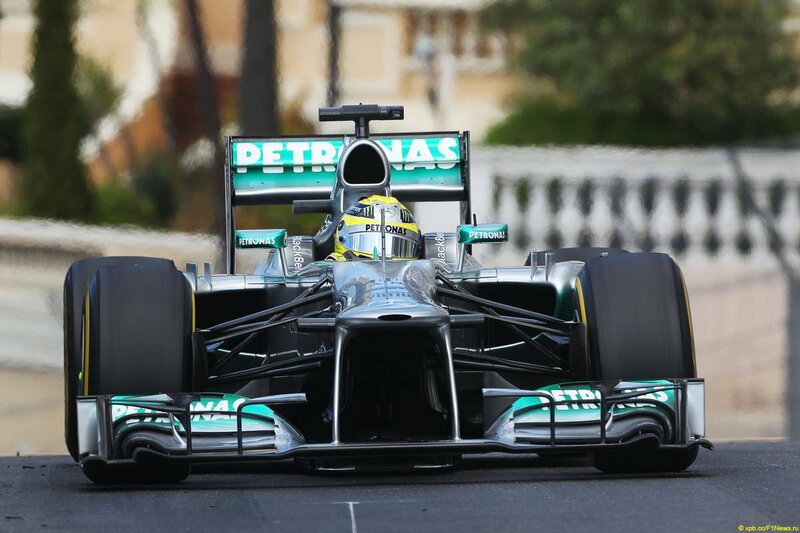 Rosberg gets a horrible start but still keeps the lead thanks to the nature of Monaco. Had it been China, he would have been 3rd or 4th at turn 1. 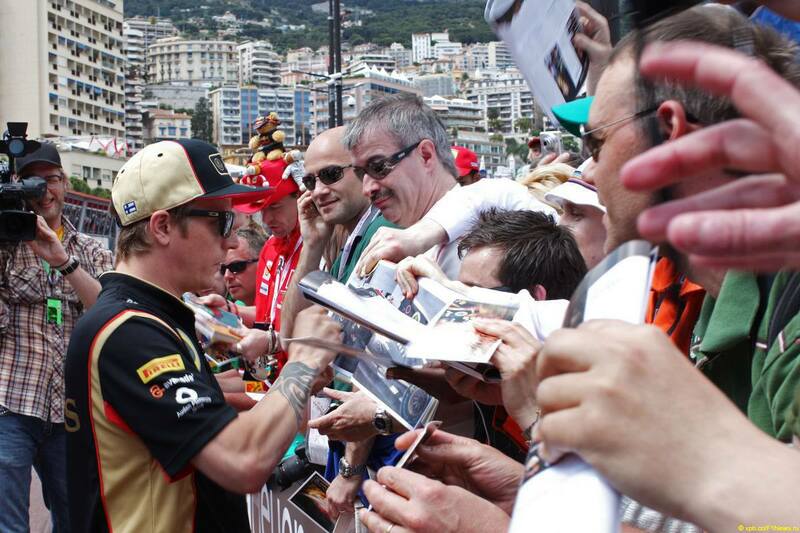 Kimi manages to keep Alonso behind him – also thanks to Monaco and the short run to turn 1. By some miracle, Grosjean makes it through the first corner and lap without incident. (That I know of). Alonso is feisty behind Kimi but cannot find a way through. Say what you will about Alonso, but the man knows the limits of Monaco and is very fair on the race track. After a while the cars settle in somewhat. And I say somewhat because it quickly comes abundantly clear that one place the fickle Pirelli rubber doesn’t fit – is Monaco. It’s gets almost comical as you see the Mercedes cars conserving their tires and the cars behind having a lot more pace in hand, frantically trying to find a way to pass the car in front. Result, we get botches of car trains behind cars that are preserving tire life. So the field is a lot more bunched up than usual. This is sending chain effects down the order. Where faster cars that are nudging against the car in front are making themselves a target for an attack from the car behind. Sidenote: It’s a sad sad sight to see the leader of the GP just slouching lazily through the swimming pool chicane. No drama or push. Just taking it as easy as possible. I think back to 2006. 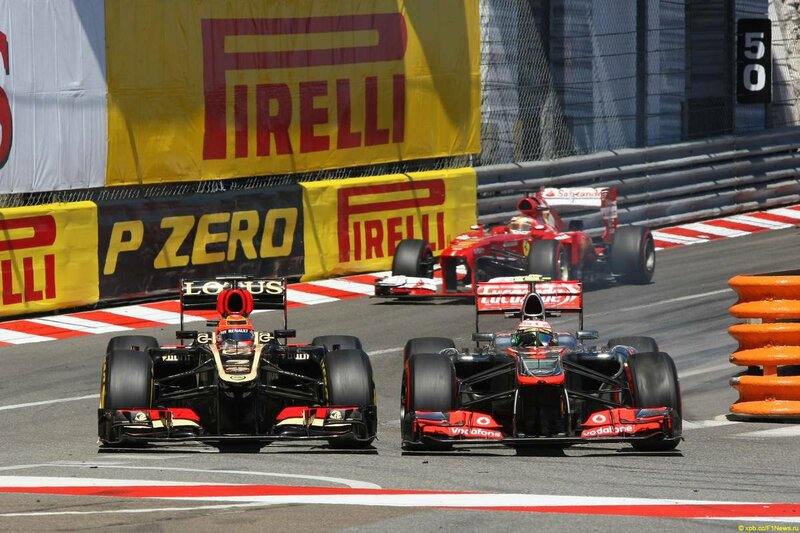 Alonso is leading the race and Kimi is right on his heels, chasing him down. And they both went through the same chicane at such speed that it took your breath away. 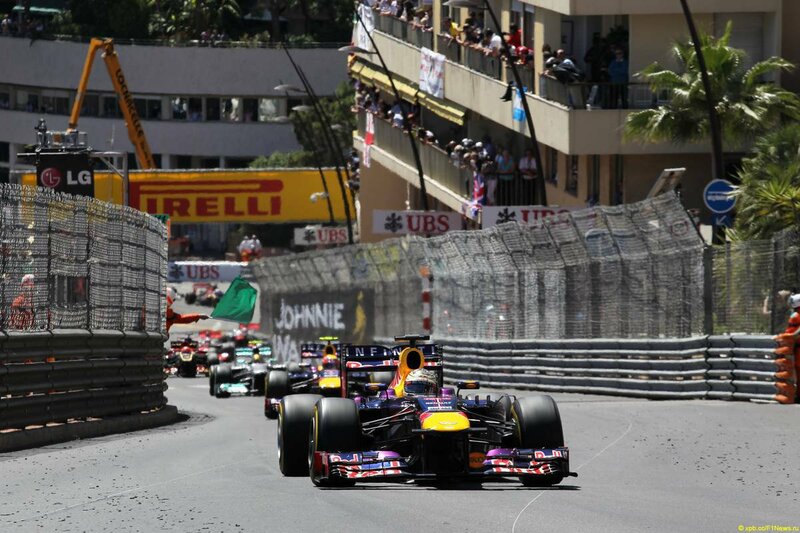 Although the tires give some interesting races, the spectacle of the speed in Monaco is gone with the current rubber. Pitstops happen and Kimi pits on lap 27, around the same time as the others and a lot earlier than I had thought. Its a good quick stop from Lotus. Alonso pits 2 laps later and is very close to jumping Kimi even though Kimi had the upper hand with the earlier stop. Possibly traffic on his out lap. But he stays ahead of the red car. The next red car we see is the Ferrari of Massa in the barrier at Sainte Devote. An exact replica of his practice crash! Red Bull is quick to react and pits Sebastian just before the safety car comes out. With both Mercs unpitted, it could prove disastrous for them. They cannot drive faster than the pace time set for the SC period. What happens is that Hamilton drops back a pit to avoid a queue in the pitlane. However, that gap was enough for Vettel and Webber to jump Hamilton up to 2nd and 3rd place. The restarts are not kind to the Lotus car. Being gentle on the tires usually means taking a bit more time in getting the pressure and temperature up to snuff. Alonso tries to take advantage, but sees that Raikkonen has got him covered at the hairpin and the chicane. Alonsos attempts leaves him vulnerable to Button who has a little go at the hairpin and nudges Alonsos rear wheel with his front wing. By some black magic or voodoo, Alonso avoids a puncture and keeps going. The first real victim of this previously mentioned “bunching up” is Button. Perez practically does a hailmary on the inside of the Brit at the chicane, hoping he will yield. Button being the gentleman he is and probably more so because it’s the sister car, lets Perez have the pass. A good move but probably only made possible due to Button knowing the importance of bringing both cars home. Unfortunately this sets off something in Perez’ head. Thinking that “this will be equally as easy with every other car. Because I am just that good.” But he wasn’t. Next one in his sights is Alonso. He dives on the inside, hoping Alonso will be just as polite as Button. The Ferrari has to move out of the way to avoid contact. The stewards felt that was wrong and later ruled that Alonso had to let Perez pass. Which was the worst possible ruling in this case. Because it gave Perez a green light in his mind to keep doing the exact same move on everyone in front of him. I like seeing Alonso get passed as much as the next guy. But this was just wrong in my opinion. Sure, Perez had the inside and he made the turn. But the pass was not 100% complete. And it just nursed the wrong ego at the time and it could only end in tears..
As it stands, Maldonado has not finished a single Monaco race in his F1 career. Well, the red flag gives everyone the opportunity to change tires and with that any chance of Kimi doing one less stop than his rivals is gone. The race restarts behind the safety car and Alonso gives the place to Perez. Which means we have one loco red misted Mexican behind Kimi. 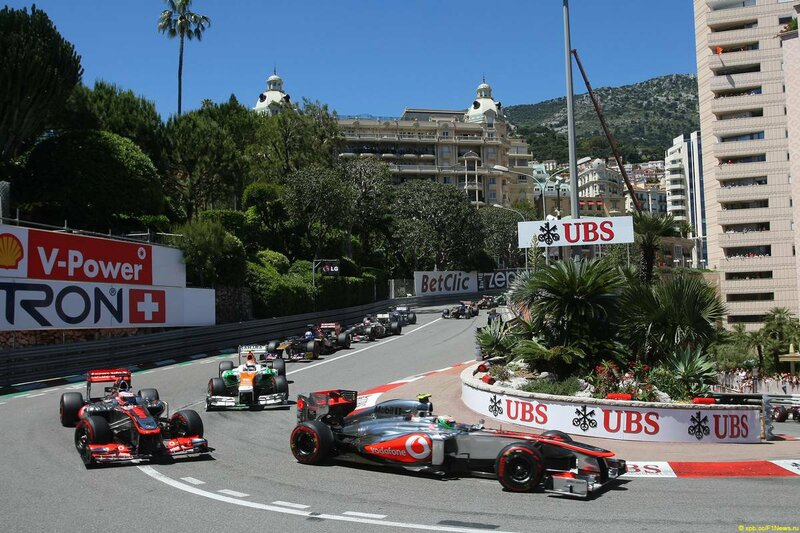 Sutil does a succesful move on Jenson Button in the hairpin. Well executed. Sutil now trails Alonso. Sutil gets it completely right again in the hairpin against Alonso and stabs 7th position in the neck. A cheeky move which paid off. Another result and effect of a car in front (in this case, Vettel) bunching everyone up while saving tires. The Toro Rosso is shy and fends him off, leaving carbon-fibre carnage strewn all over the chicane. The cost of spare parts that Grosjean has destroyed in Monaco alone, is now equivalent to the national product of Burkina Faso. Not good for a team that suffered a big financial loss in 2012. Boullier, wake up and smell the fromage. He is supposed to help Kimi, not work against him! rearwheel when there is contact. He did not have the line or the position or anything that even remotely would give a sane person a reason to try a pass. The little #¤%& even has the audacity to lift his hand after the tangle. Not to mention putting the blame on Raikkonen after the race. And with that he is suddenly and literally unbelievably in the points again. From 16th to 10th in 7 laps. 5 passes since Perez retired. Granted on fresh tires, but this is Monaco! Not a Tilke drome with a 4 lane highway track. Kimi on the Hunt. We need more of that anger in Canada but without him losing places. Yeah. That’d be great. He hits the limiter way before he is even past him but he is so determined and brakes so late to just make it stick on the outside. Incredible. I like the fact that the BBC commentators were so puzzled to see Kimi in 10th at the end that they were adamant there had been an incident. Lol. Yea, there was. The Iceman unleashed. So it is still unknown what the outcome of the controversy will be. But Rosbergs win is safe. The FIA have made the results official. My Race Rating is a 7 out of 10. 2 extra points gained only due to Kimis display of awesomeness in the end. I would have been happier with a 5th place though. But its all to play for in Canada. The track is typically tough on tires so lets hope it will play into the hands of the E21 and the tire whisperer. Bird, bird, bird. Bird is the word. I think his name is Sam. This entry was posted in Formula 1 and tagged 2013, Alonso, Button, F1, Fernando Alonso, Ferrari, Formula 1, Hamilton, Ice cream incident, Iceman, Kimi, Kimi 2013, Kimi Checo Monaco, Kimi final laps Monaco, Kimi Lotus, Kimi Lotus 2013, Kimi Perez 2013, Kimi Perez crash, Kimi Perez Monaco, kimi raikkonen, Kimi Sergio Perez, lotus team, McLaren, Perez crash monaco, Romain Grosjean, Sebastian Vettel, The Iceman, Vettel. Bookmark the permalink. Well they were on “provisional” pole here last year, only a different coloured helmet driver. It really depends if they can manage the tyres. They were able to block the field in Monaco, and probably had pretty good race pace anwyay, it really doesn’t stress the rear tyres like most other tracks. If they can improve on Spain and get back to Malaysia-like race pace, then they can challenge for more race wins. I agree about Kimi’s last laps, 16th to 10th nice! I got showed 13th to 10th, nobody seems to have the others. I agree about the tyres. They have been getting worse every year, perhaps 2011 was the best balance for racing and the show, 2012 went a little too far and now 2013 is really far too far. True that, Jack. There were indeed some good shows from them last year now and then. But 4 poles in a row is pretty spectacular. First team to do that since Red Bull took over at the front. As for tires, it seems we are stuck with them for the remainder of the year. Great stuff as always, Soren! For some reason your review calms me down a notch, although I haven’t been this mad for a long time after a race. These wasted points could turn out to be the difference between make or brake in Kimis championship quest. You pinpoint it exactly; the approval on the Button and Alonso moves made the moron think that he had just discovered something that generations of great racing drivers never figured out – the sure pass in Monaco. He is so damn naive, that a loose comment from Whitmarsh is enough to make that little f… just spin around in his own selfgloryfication. And talking about MW; how low can you allow yourself to sink just to try to prevent that stupid decision of hiring Perez to get too obvious? Defending a move like that is more than just being loyal to a driver -it’s a sign of desperation over long time miscarried team management. Please, wipe that smile off your face if you want anyone to believe you talk like you mean it! The best decision made in Maranello for years was realizing what Perez actually was made of; an overinflated self confidence with nothing more to it. Well, sorry to get hung up in the matter, but this crash really pissed me off. Kimi on the other hand really made my day on those closing laps! But where is the acknowledgment in the media for that? A poll on F1.com over best overtakes during the race -and who is suggested- Perez??? The British writers both in BBC, F1.com and -God forbid-Planetf1.com are all related to Andrew baby benson, and spit out more sh”t towards Kimi than the www can absorbe. The only balanced articles in english are to be found at jamesallenonf1 and for once in Coulthards race report. And then there’s the tire gate… Too big a case to get into in a review, I see that, Soren, but any thoughts on that? Again, thanks a lot Soren! Thanks Chris 🙂 Huh, didnt think of that. Perhaps its a desperate way of justifying the choice of Perez from Whitmarsh. Or to please the man with the big bucks behind him. I hope not. Because that would be a sad state of affairs for a team like McLaren. Tire gate? I think I will just wait and see the outcome. Mercedes must have at least gained some advantage from the test. But how are the FIA gonna go about penalizing that? So, I will just wait it out. Thanks for the review. I think we also have to agree with Luca di Montezemolo when he said last year that Perez was not ready for a top team right? I also agree with you that he has some ego thing going on; and it got worse after Carlos Slim came to watch him race… I feel sorry for McLaren though. I have been reading comments on the net that Kimi was wrong to do what he did as he is fighting for the championship, even Perez had the nerve to say that, well, I think and I hope that it will serve as a warning to Perez next time he is close to Kimi, like this, “Yes, I’m fighting for points, but do not mess with me.” Alonso and Button didn’t do this and we saw what happened, and it will keep happening, and in the end it is not good for the driver’s confidence, to get owned like that. Tons of comments I read were asking if Alonso was asleep in the car, one comment even said that he did not have motivation LOL !!!!! And Perez now have the support from his Boss who now has a big sponsor secured so I wonder if they are thinking “what the hell, we are not fighting for anything this year so we might as well just let Perez get some experience”. Even if it means destroying other driver’s races. On the other hand, I understand the argument that Alonso was smart to be cautious; Kimi was cautious last year and he got 3rd place, but I heard commentators saying he was too passive –though, I thought he had his moments of attack/defend– and some were wondering where was the old Kimi? The one from McLaren and the one from 2007 Ferrari? Well, guess what? He is Back! Like you brilliantly described him in the last few laps. Cheers Nana. About Perez, I really think he has entered into a bad spiral when it comes to his moves on track. His confidence is much higher than what his talent allows. And that is why we will likely have more and more disgruntled drivers over his actions. Soren, you yourself were heaping praise on the mexican upstart just a couple of races ago, and his move on Kimi then was not much better, or so we all thought. Could be he got the wrong idea from reading that, LOL, ! 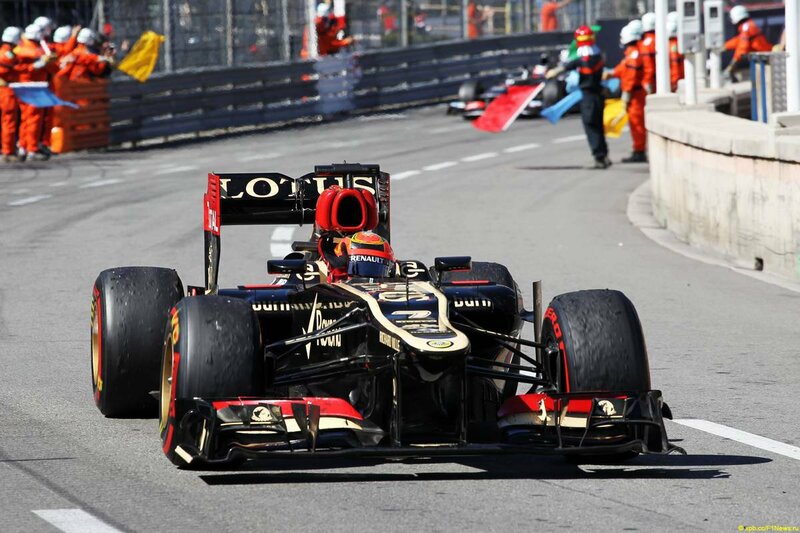 Will we see Grosjean again on the track, do you reckon? His morale must be totally shredded. I believe he tried his utmost to get on terms with his team mate, and he was often faster in quali as you know. Boullier should have given him better advice about how to deal with his very special team mate. 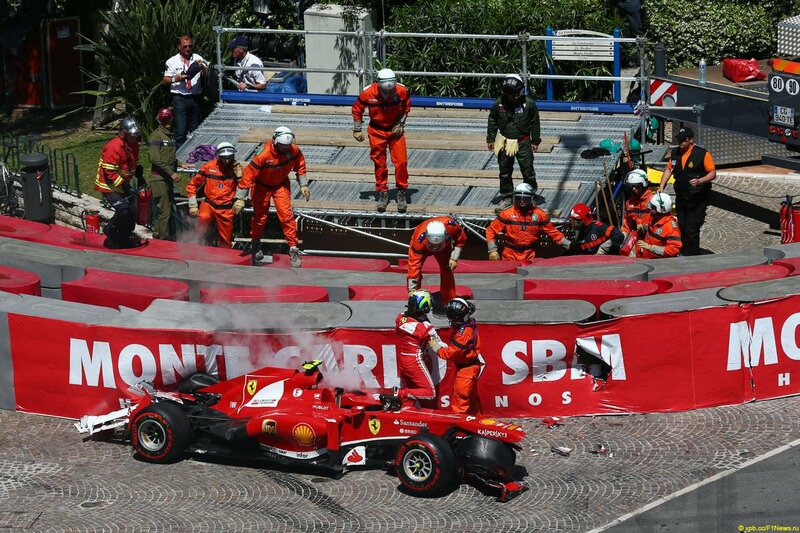 Kimi has left every one semi-broken in his wake: Heidfeld, Coultard, Montoya, Grosjean. Massa alone survived, but that’s another story. My question, if I may ask, is what you make of Bianchi as a fitting replacement? Haha! That is true, John. I guess you could say there is selective memory at play. 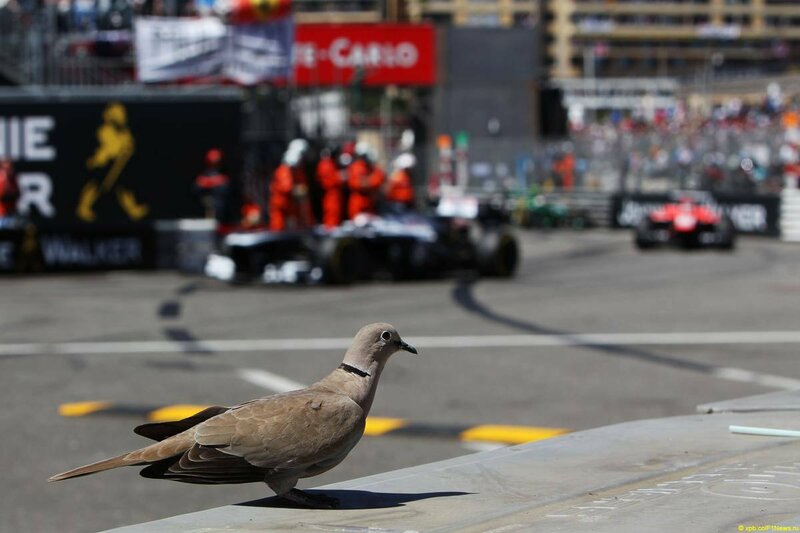 But Bahrain is a different and more forgiving animal than Monaco. Grosjean would be out already if it weren’t for Boullier. He is hanging on to him. But there are forces higher up in the team whose patience is spent. One more disastrous weekend and I will be surprised if we see him in the car after the summer break. I could not tell you if Bianchi would be fitting or not. Have not followed him closely enough to say. I would rather see Kovalainen in there. He is fast and consistent and would be a perfect teammate for Kimi. And not because he is Finnish. Great work, Søren! Nothing more to add for my part concerning the sum up! I see the rubber scandal has been discussed already. I think consequences for Mercedes are unavoidable, no matter what excuses they try to fabricate. Do you think points will be taken away? And dwelling on the theme of consequences. What do you reckon will be the fate of Grosjean and Perez? Money talks? Yo laffen! I really don’t have a qualified guess on the Merc situation. Button believes they will only receive a slap on the wrist. Points could potentially be taken away from the constructors and the drivers keeping theirs. Like McLaren in 2007. That would be weird for Hamilton, wouldn’t it? My guess is that Grosjean will be out during this season. I doubt he can keep his nose clean for more than a couple of races. Anyway, really enjoyed your review. Yea, I’m really disappointed in Whitmarsh for approving of Perez moves. But maybe it’s because Kimi turned down McLarens offer to drive for them in 2013? Perez is like Kimi during his McLaren days? NEVER! He has already crashed into people more than Kimi did in his entire time there..
Perez’ arrogance and overconfidence is clearly his weakness. Kimi had the line covered on the inside going into Nouvelle Chicane, yet Perez just wouldn’t let it go and eventually crashed into him. Even his overtakes on Alonso and Button weren’t that great, they just relied on Fred and Jenson not wanting to defend and risk a collision. Yup. By Perez own admission he thought he could take advantage due to the WDC contenders not wanting to risk it. Hey Soren, thanx for the review. As not always but lately a pleasure to read, even for a Alonso-nuthugger like me. Any chance of getting Grosjean replaced before Singapore? The bets are on. Seeing Grosjeans performance in qualifying in Canada today, I think he may very well be out before Singapore. Only thing that would keep him is how much weight Boullier has in the decision.